Also known as Festival Kesenian Rakyat Antarabangsa Sabah, the seventh edition of this international event is currently ongoing. Scheduled to kick of on July 8, but as we drive through the main venue, Sabah Cultural Centre yesterday there was nothing much going on yet. 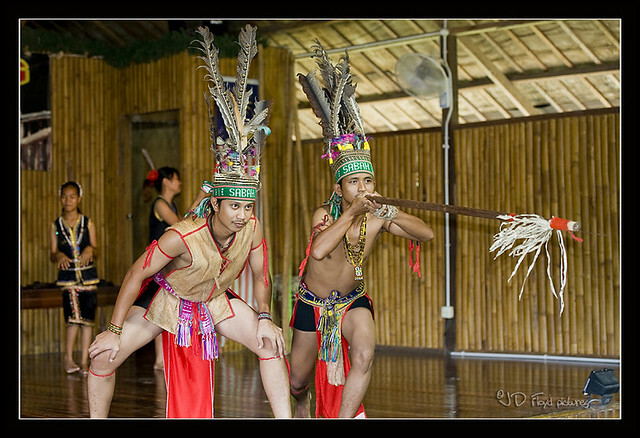 Hunting with blowpipe is one of the rituals during the local ethnic Murut traditional dance. The cultural parade is jointly organised by Sabah Cultural Board (SCB) and Kota Kinabalu City Hall (DBKK), and is to be flagged off at Wisma Budaya starting at 1.30pm by SCB Chairman, Datuk Wenses Anggang. From Wisma Budaya, the parade will proceed to Lintasan Deasoka for 'pocket show' via Jalan Laiman Diki and Jalan Tugu, in front of City Hall. All the participating international troops and local cultural groups are expected to participate in the parade. Only the international troops will perform in Lintasan Deasoka though. The parade will then proceed through Gaya Street and will end at Kota Kinabalu Community Centre. As such, roads mentioned above will be closed in stages to make way for the troops. This is actually a very good opportunity for the public and especially photographers to make full coverage of the event. I've done one earlier this year during the Universiti Malaysia Sabah annual parade along the streets of Kota Kinabalu. I attended last year event and it was impressive!! Looks like fun to watch the different cultural dances and costumes. And, of course, enjoy the food. Love the costumes -- sounds like a wonderful festival. For a peek of what's in store this weekend, check out the Introductory performance here. Enjoy ya.